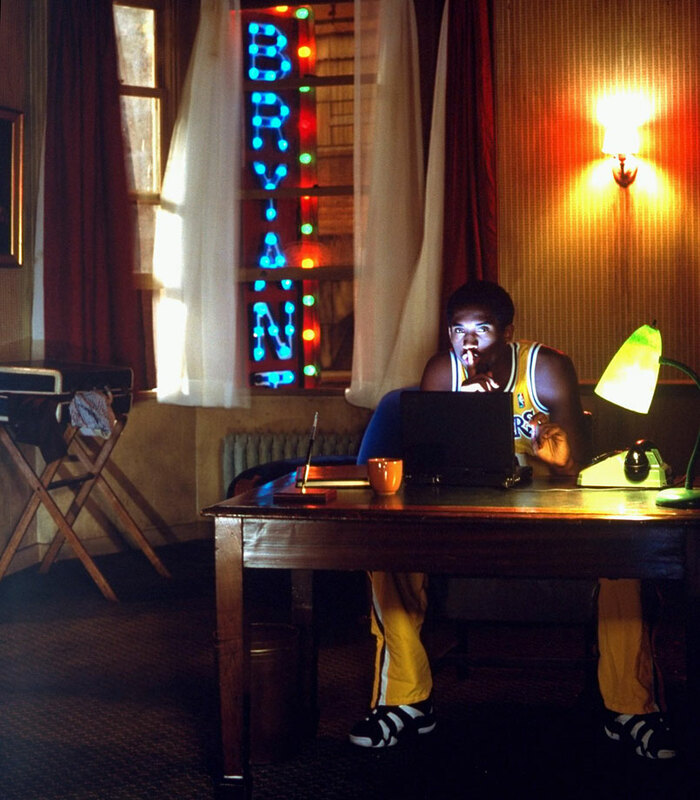 Here are some rare photos through the years of Kobe Bryant, aka "Black Mamba," an 18-time All-Star, 2007-08 MVP and two-time NBA Finals MVP. 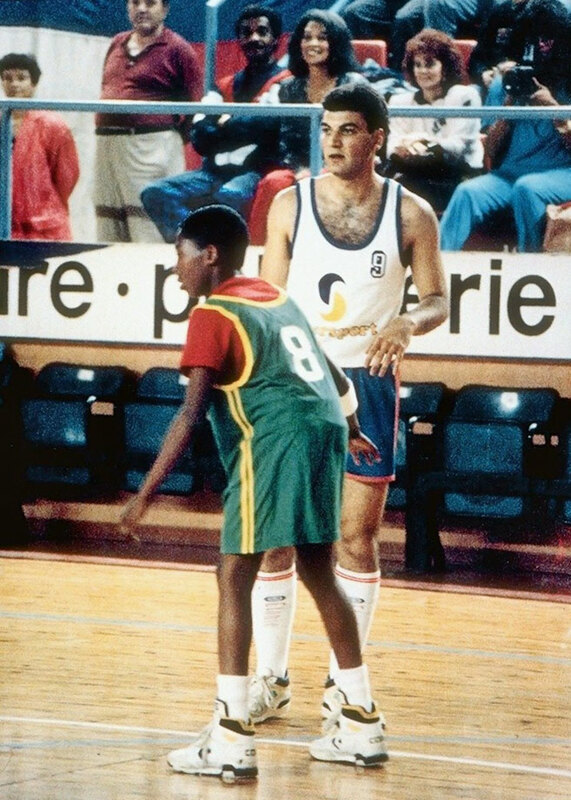 Kobe, age 11, plays in a fundraiser while living in Italy. 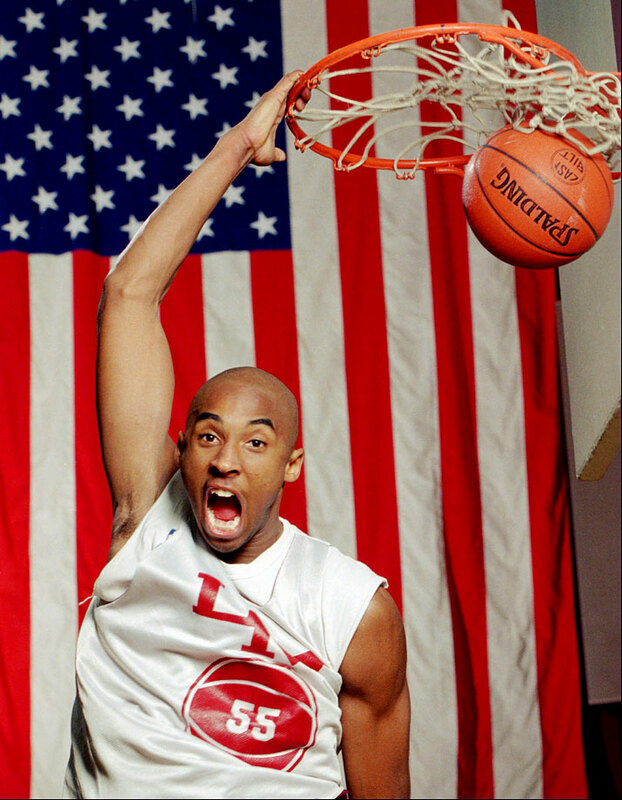 Kobe dunks the ball at his Lower Merion, Pa. high school gym during a practice on Jan. 19, 1996. 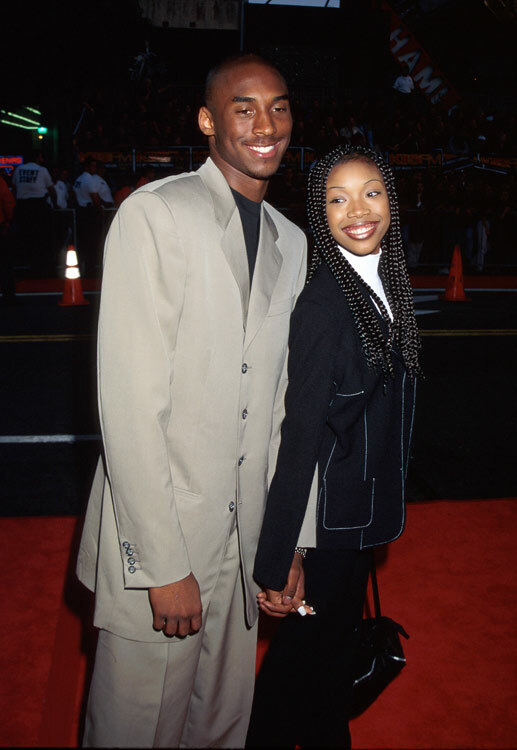 We all knew Bryant was a superstar when he took singer/actress Brandy to his high school prom in 1996. Stud. A member of the East team, Bryant shoots over the West team's Jamaal Magloire during Magic's Roundball Classic at The Palace of Auburn Hills, Mich., in April 1996. Before he became the Lakers' all-time leading scorer, Kobe Bryant was a star on the Lower Merion (Pa.) High School basketball team. 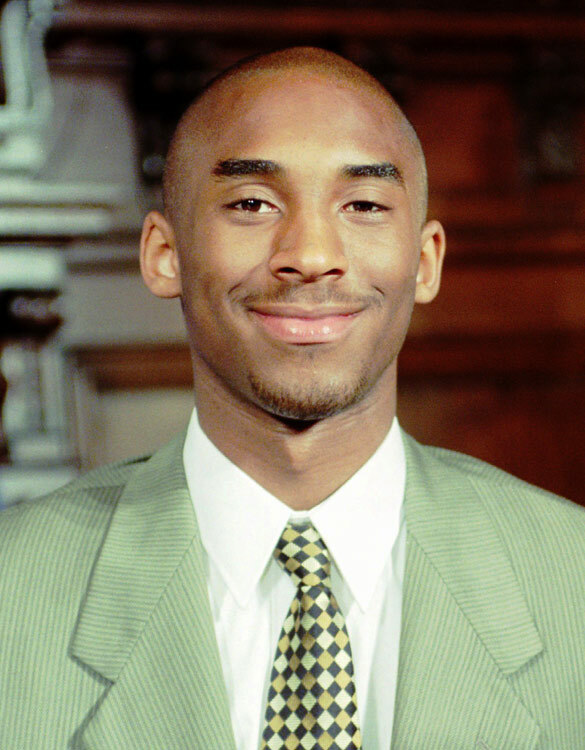 And he was all smiles in this April 1996 photo. After winning the state 4A championship, Bryant and his teammates were honored at the state capitol in Harrisburg. 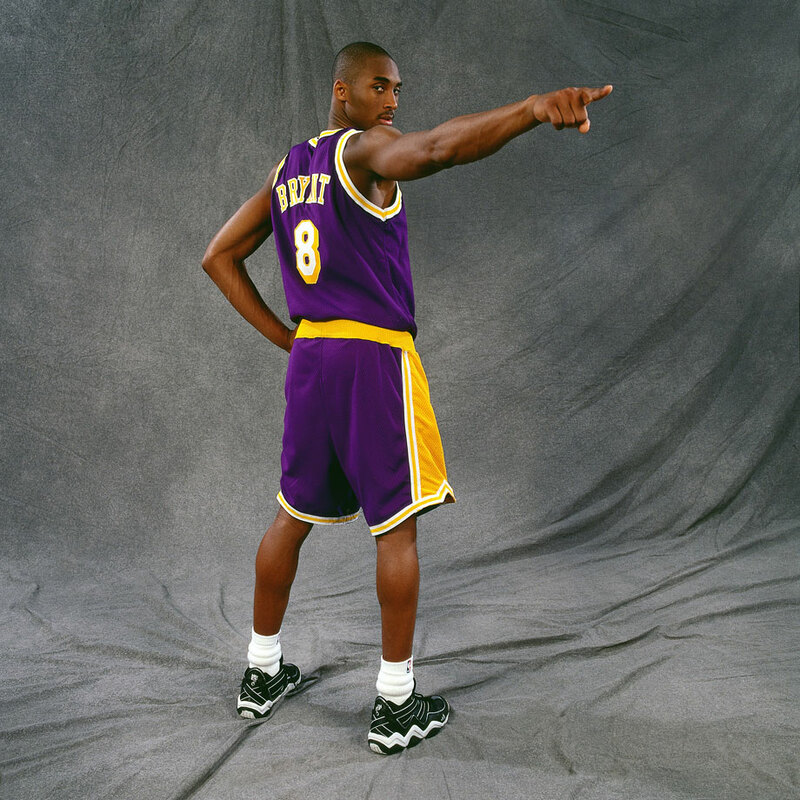 Here's Kobe, striking a pose during his rookie photo shoot. Charming. 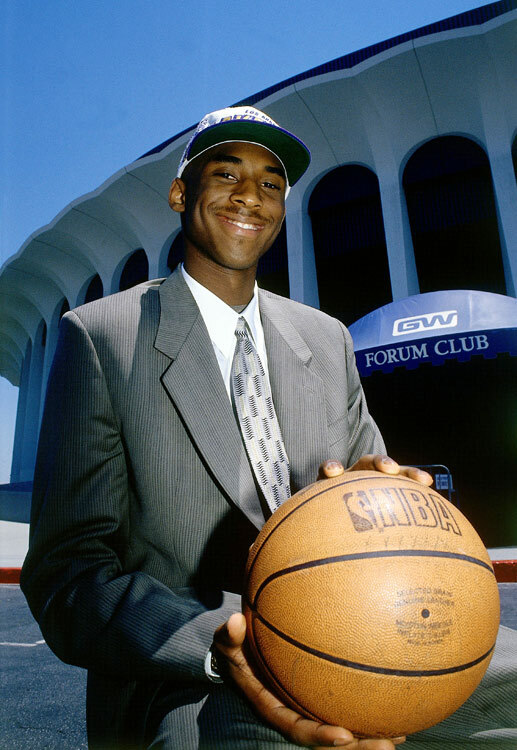 The rookie poses outside his new home in 1997, the Great Western Forum in Inglewood, Calif.
Kobe's got a secret during this photo shoot in 1997. 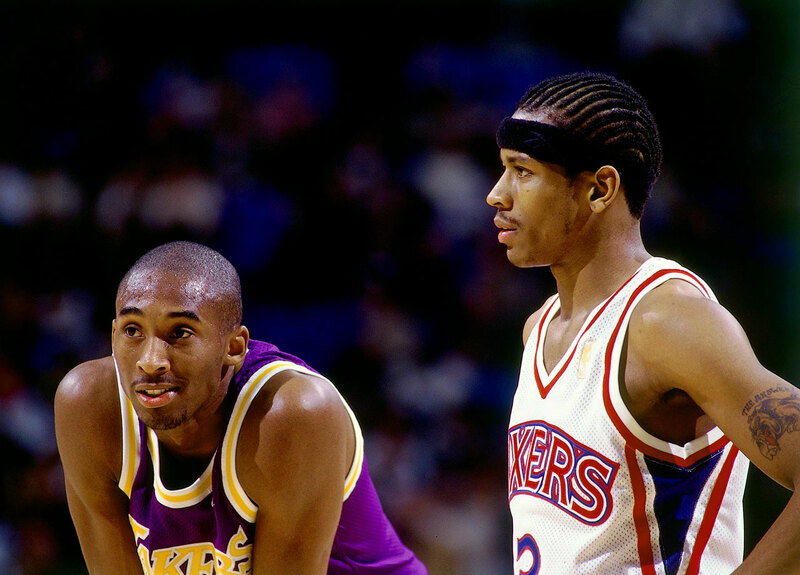 Kobe and Philadelphia's Allen Iverson chat it up during a game in 1997. My how things have changed since this 1997 photo. 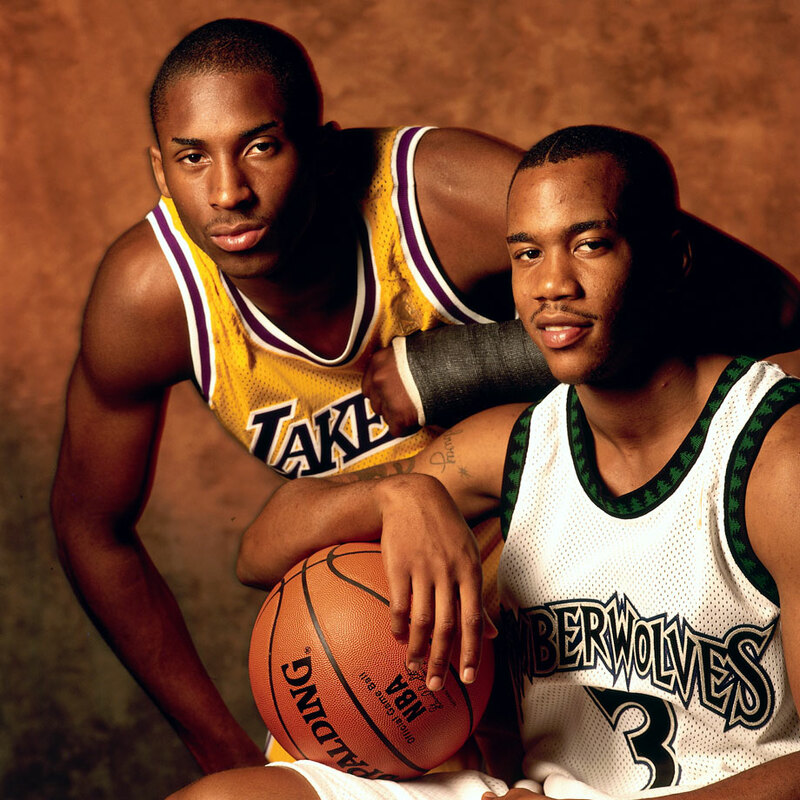 Kobe remains a top NBA player while Stephon Marbury is playing in China. 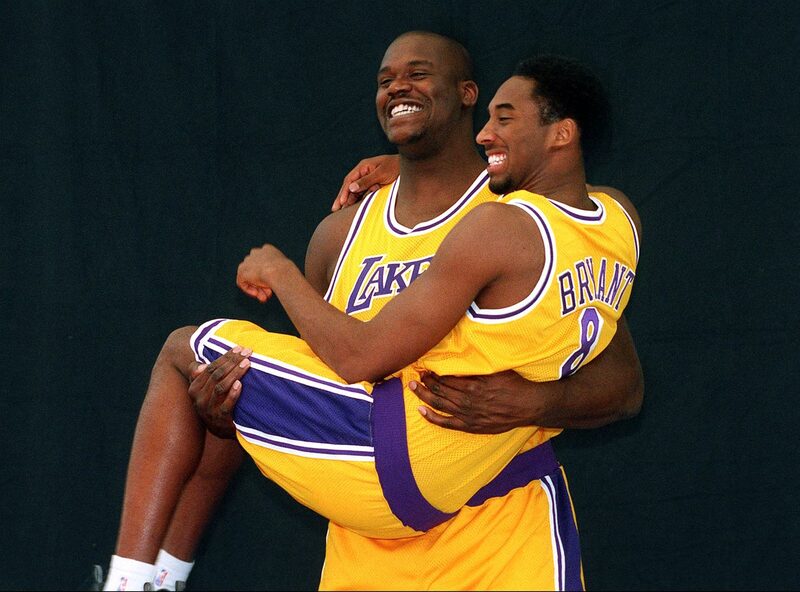 Shaquille carries Bryant during a team media day photo shoot in 1997. Aww, they look so happy! 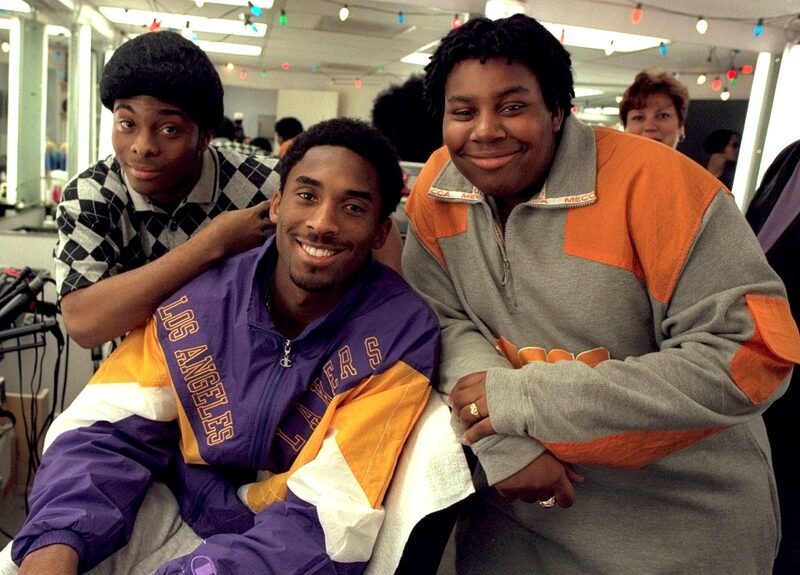 Kobe poses with Kel Mitchell and Kenan Thompson in the make-up room before taping of the show "All That" in 1998. Kobe looks concerned as Amanda Bynes acts a little crazy during taping of the show "All That" in 1998. 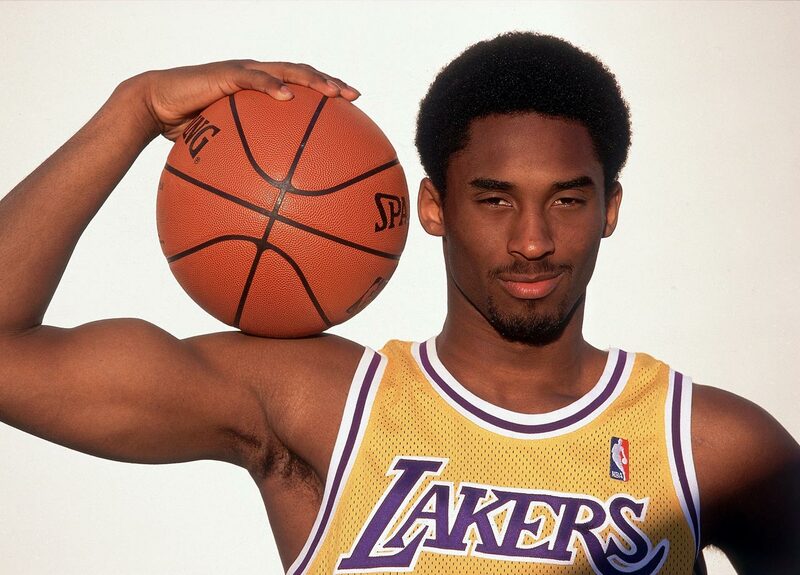 Kobe shows off his guns during this 1998 photo shoot. 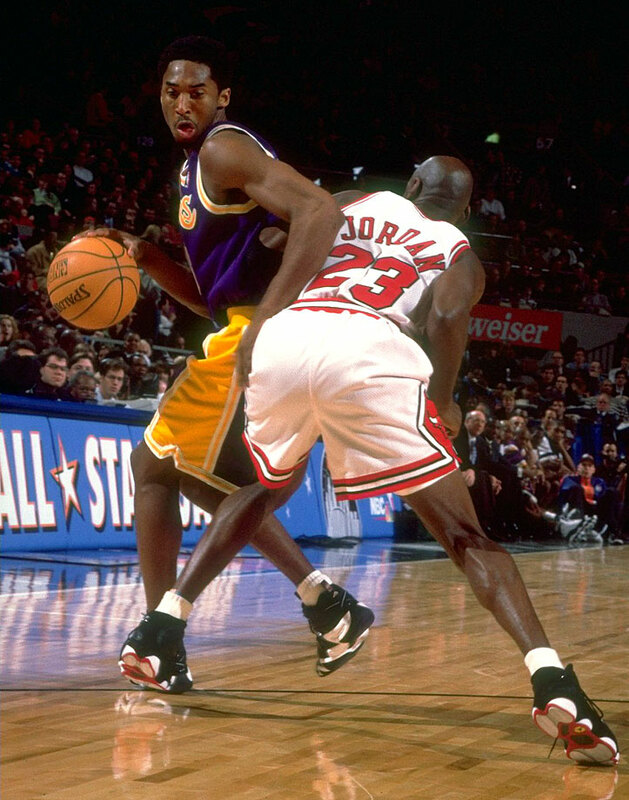 Kobe tries to get around Michael Jordan during the 1998 All-Star Game at Madison Square Garden. 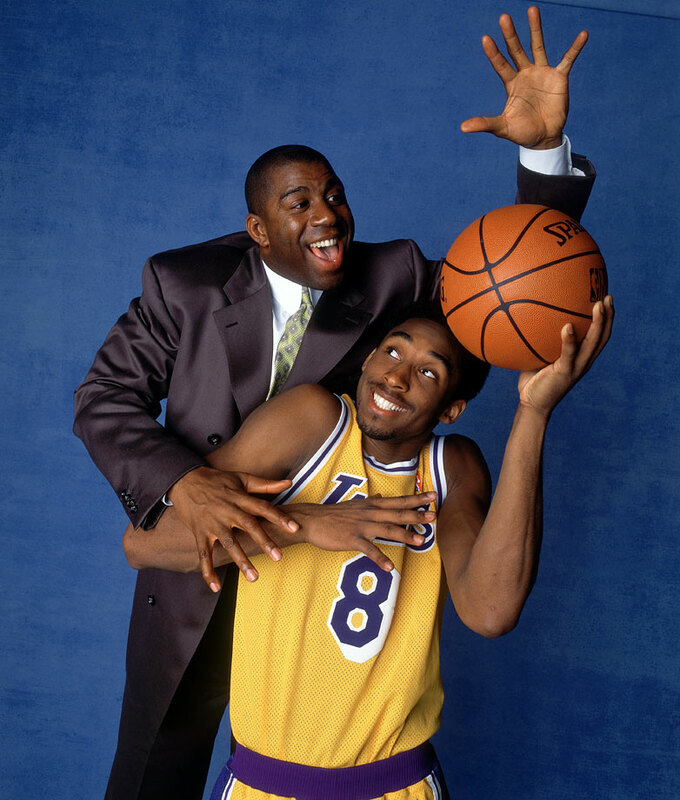 Kobe poses with Magic Johnson during this photo shoot in 1998. 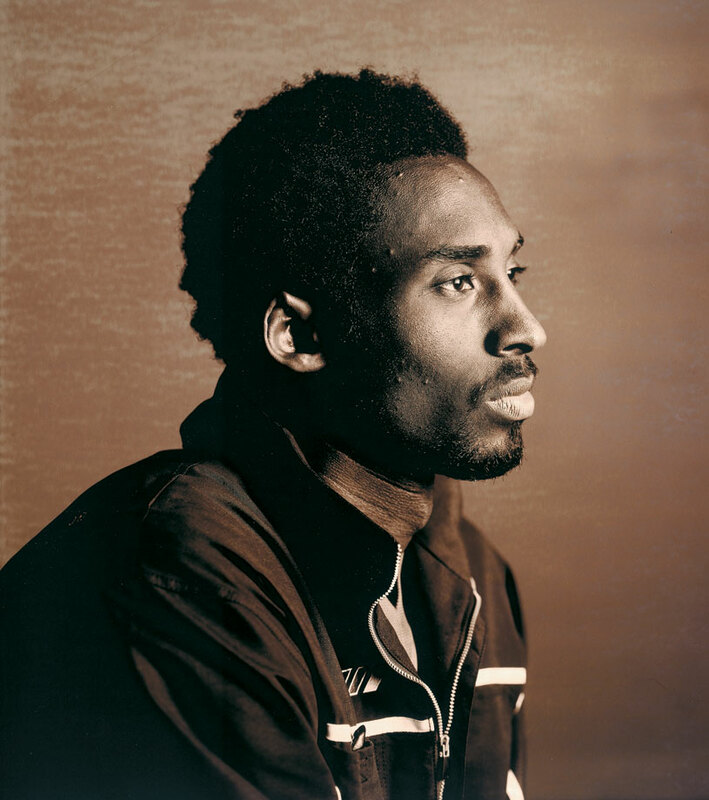 Kobe appears in deep thought during this photo shoot in 2000. 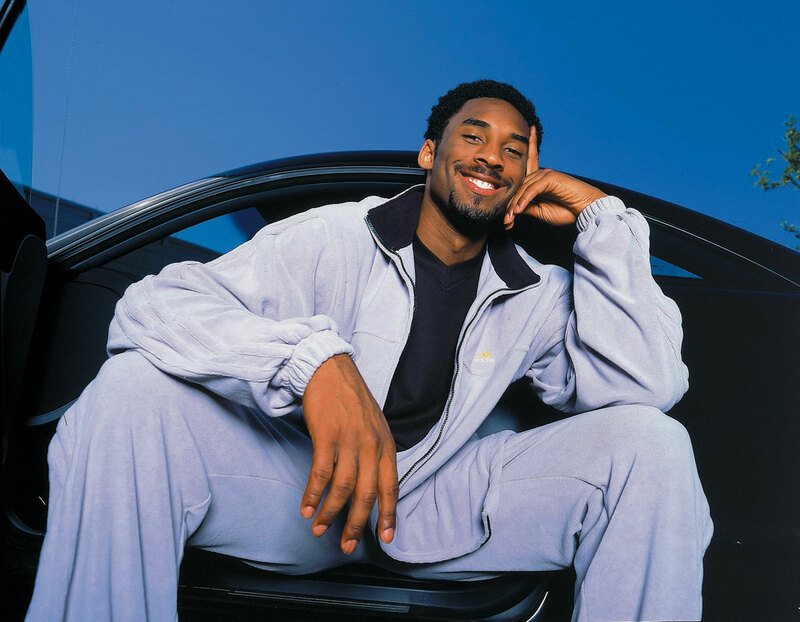 Kobe sits in what is likely one of many nice cars he owns in 2000. 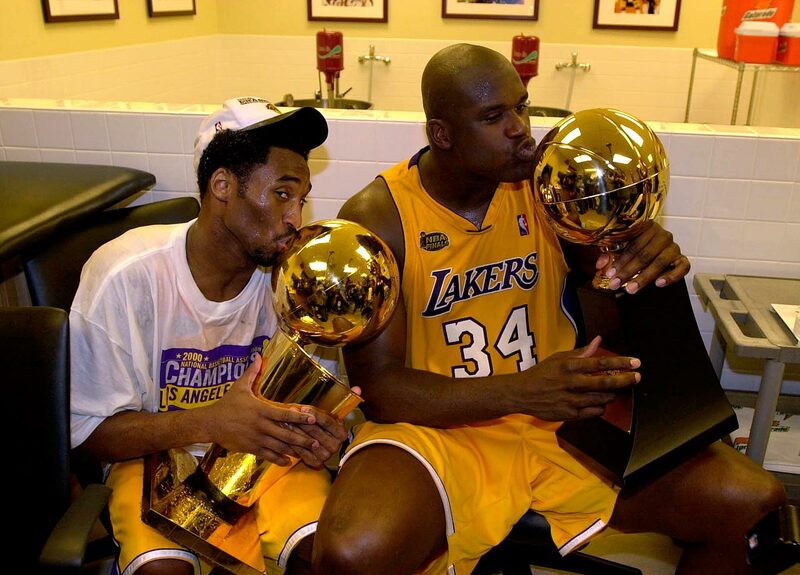 Kobe and Shaq pose with their respective make-out trophies after winning the 2000 NBA Finals. 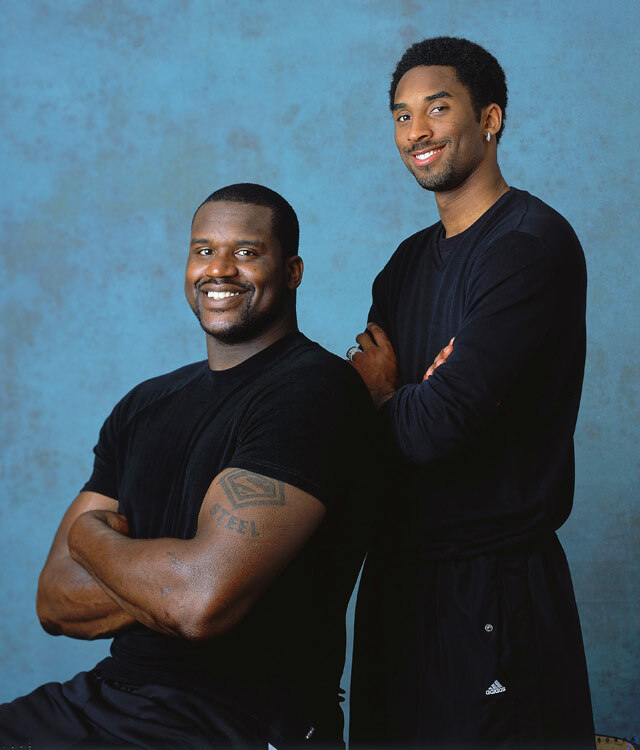 Shaq and Kobe (a.k.a. Superman and The Black Mamba) pose together in 2001. 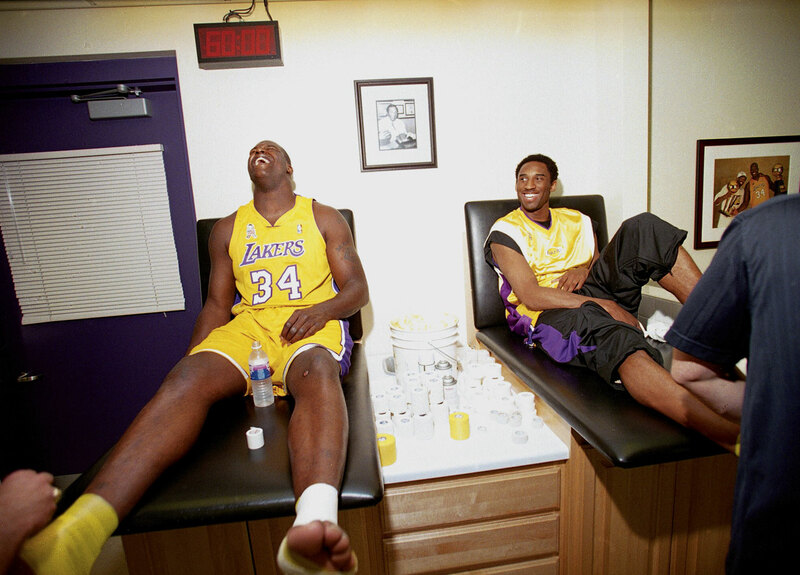 Shaq and Kobe laugh as the Big Cactus appears to have ticklish feet in the training room before a game in 2002. 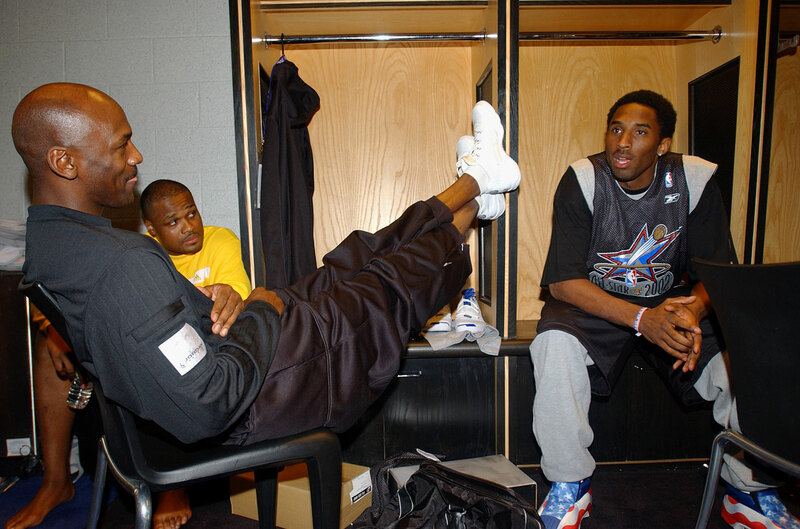 Bryant, of the West All-Star team, talks with Michael Jordan and Antoine Walker from the East team before practice during All-Star weekend in 2002. 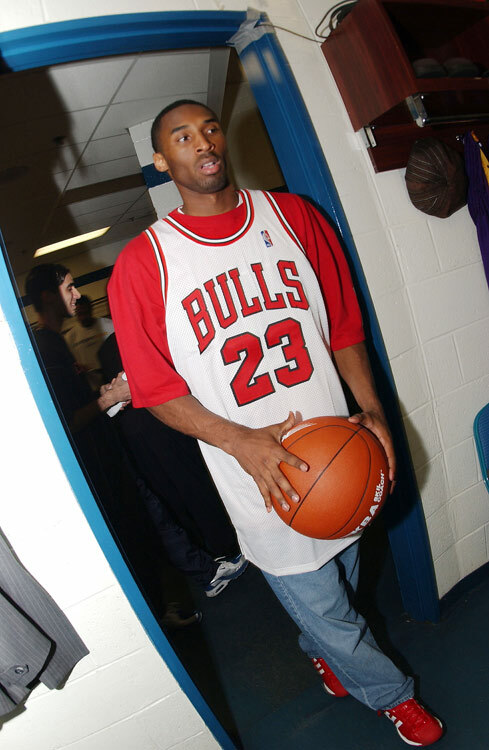 Donning a Michael Jordan jersey, Bryant arrives for Game 4 of the 2002 Finals. The 22-year-old took home his third NBA title that year. 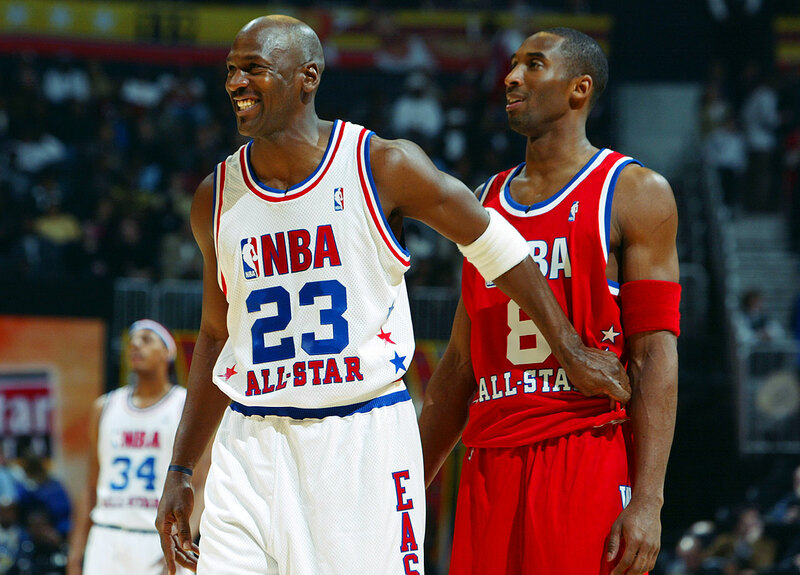 Kobe shares a laugh with Michael Jordan during the 2003 All-Star Game. 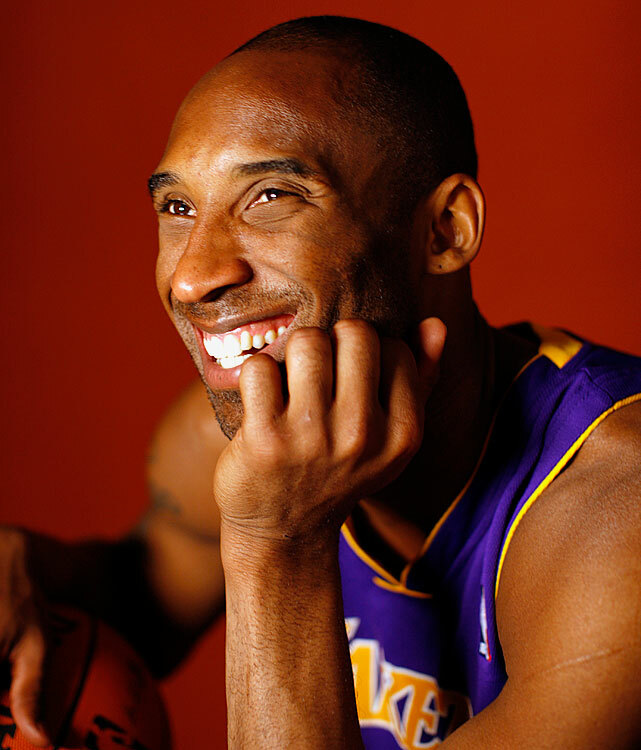 Bryant returned to Lower Merion High in 2007 to enjoy a few laughs. 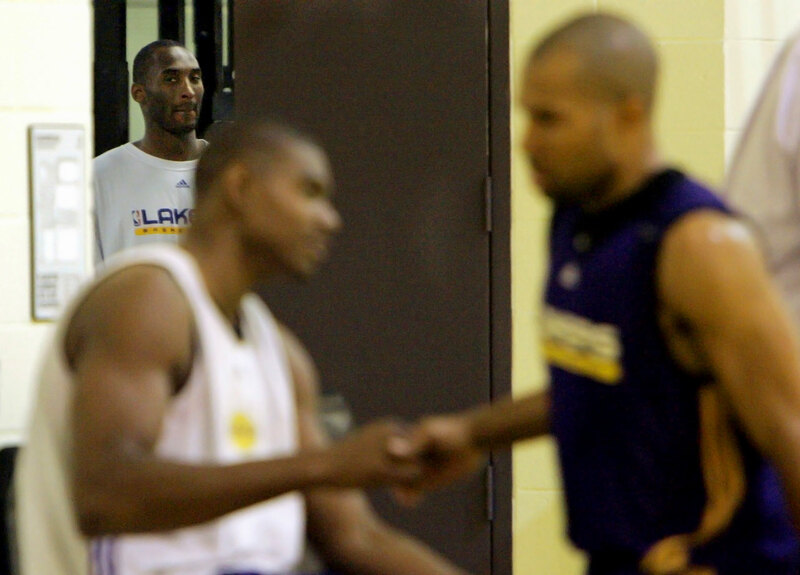 Kobe peeks out form the training room as teammates Andrew Bynum and Derek Fisher wrap up a scrimmage during basketball practice in Oct. 2007. 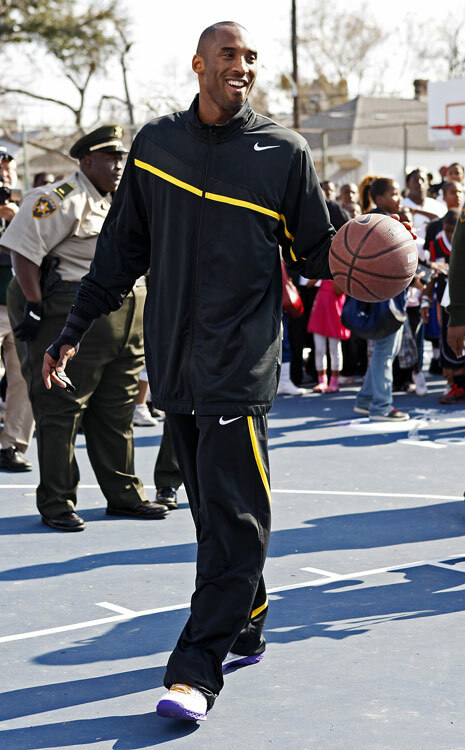 Bryant tries out the refurbished Stallings playground in New Orleans in 2008. Family portrait! 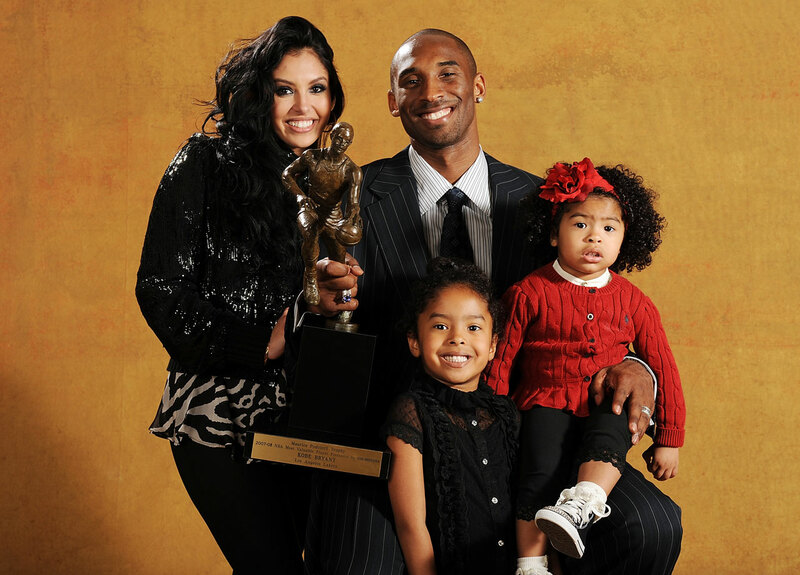 Kobe poses with wife Vanessa and daughters Natalia and Gianna at the 2007-08 MVP press conference. 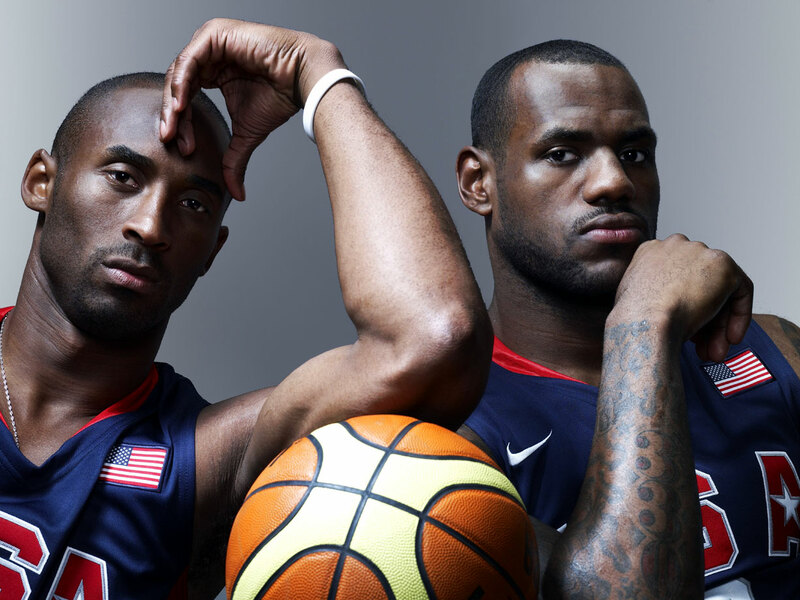 Kobe and Olympic teammate LeBron James pose before the 2008 Games in Beijing. The "Redeem Team" struck gold, ending an eight-year U.S. drought in basketball. 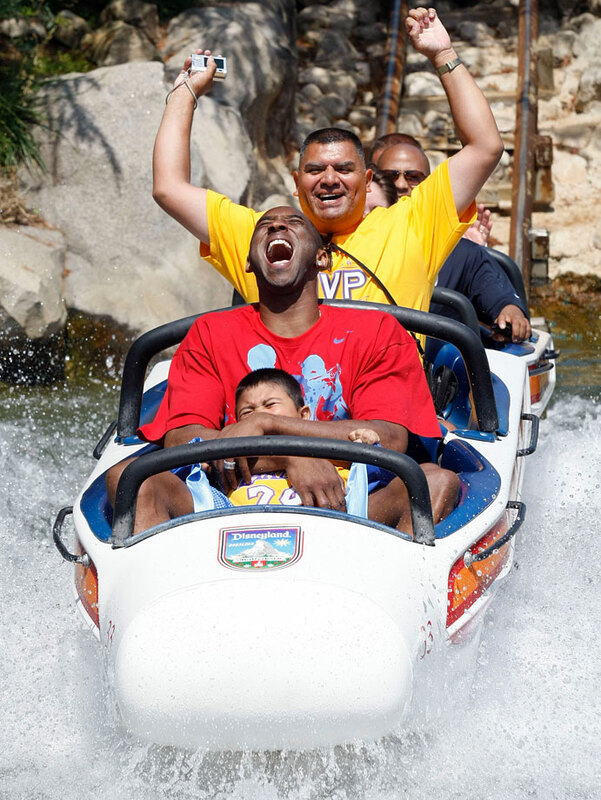 Kobe acts like a kid again, riding the Matterhorn Bobsleds at Disneyland in June 2009. Like father, like son (only the son went on to become a better basketball player). 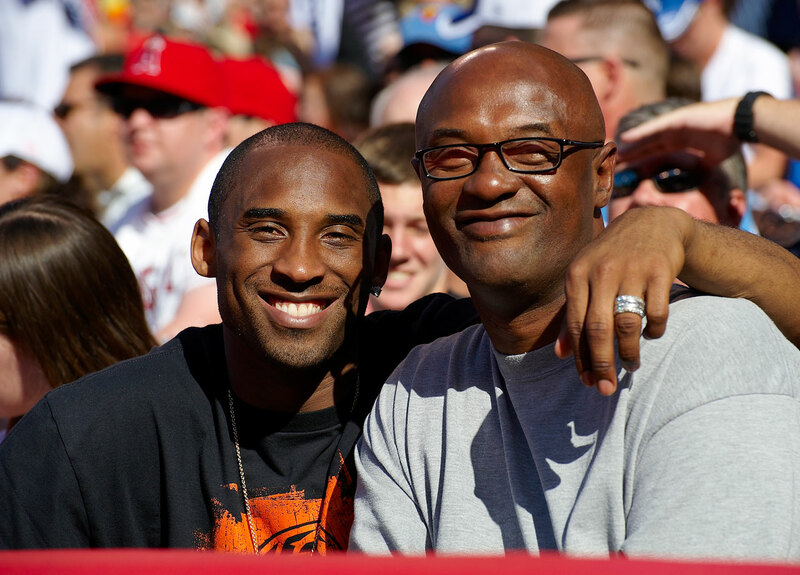 Bryant poses with his father, Joe "Jellybean" Bryant, a former Philadelphia 76er and former coach of the WNBA's L.A. Sparks, at a Dodgers game in June 2009. 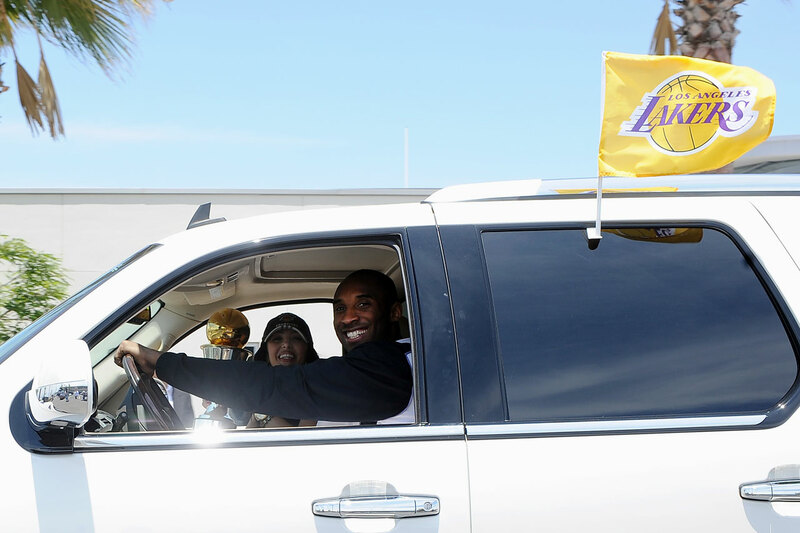 After winning his fourth title, Kobe and the Mrs. return home with his 2009 NBA Finals MVP trophy. It's as if Kobe knows he is just a few months away from winning another NBA Championship and Finals MVP during this photo shoot in March 2010. Bryant is honored at Grauman's Chinese Theater in Feb. 2011. 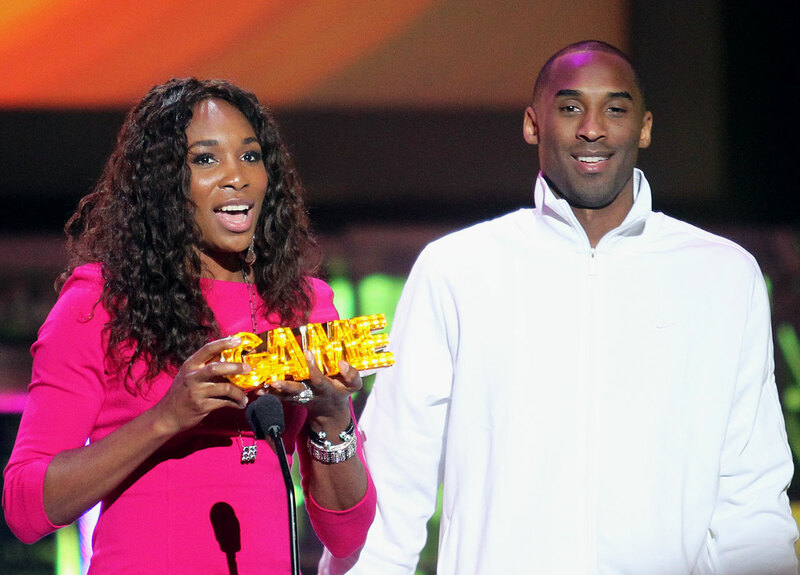 Venus Williams and Kobe speak during the 2011 Cartoon Network's "Hall of Game" Award Show in Santa Monica. 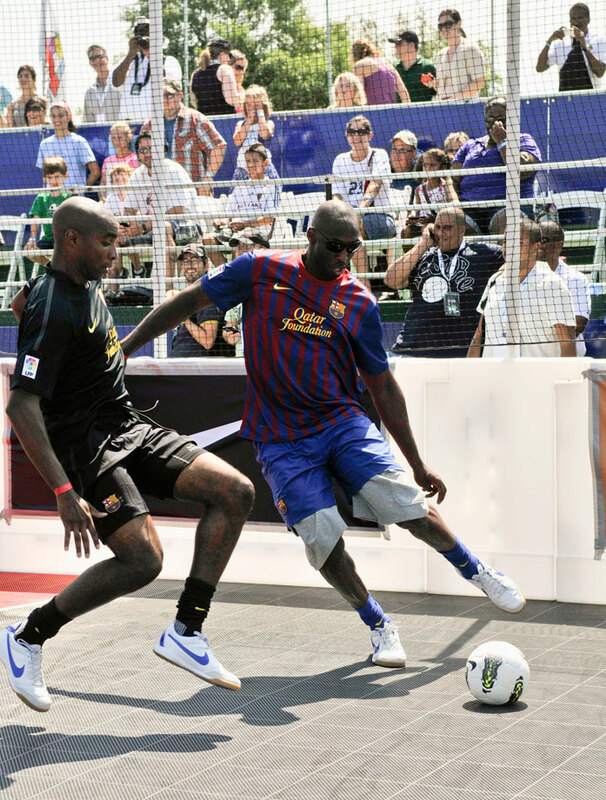 Eddie Pope and Bryant fight for the ball during the 2011 Celebrity Soccer Challenge at Kastles Stadium in Washington, D.C.
Bryant has his ankle wrapped in the locker room before a playoff game against Denver in 2012. 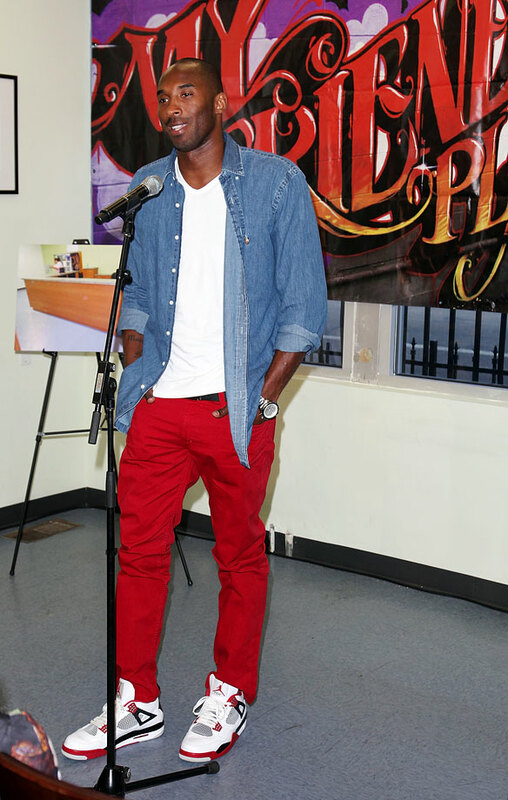 Kobe rocks red pants and Air Jordans while speaking at a 2012 press conference for the Kobe and Vanessa Bryant Family Foundation. 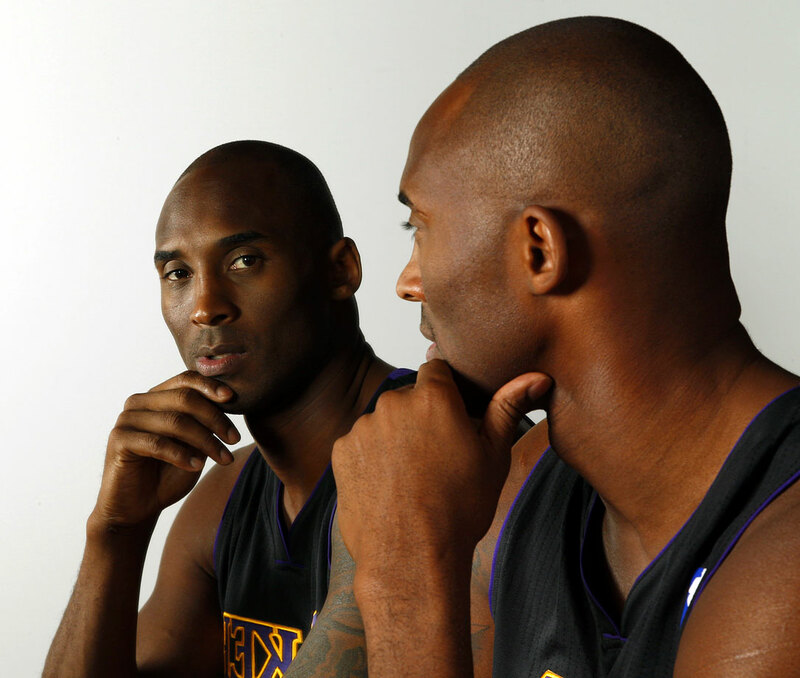 Kobe must be thinking of Timberlake's lyrics: "It's like you're my mirror. My mirror staring back at me," during this photo shoot in 2013. 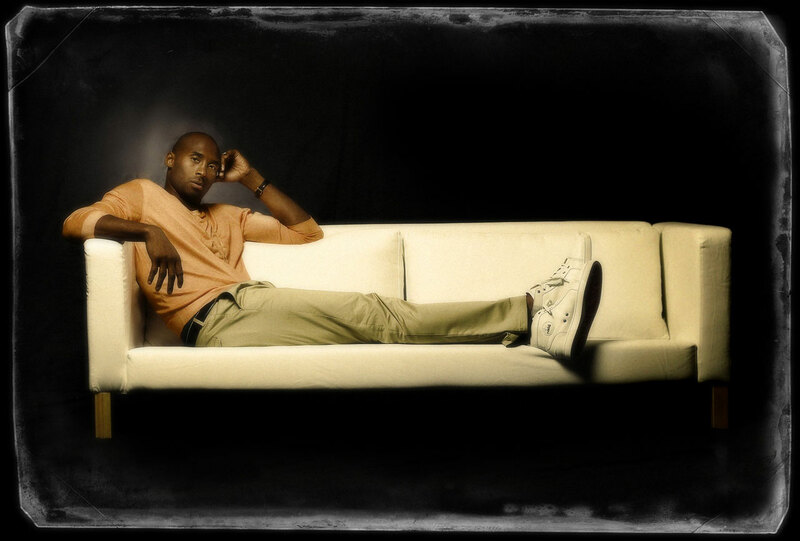 Kobe relaxes on a couch during this photo shoot in 2014. 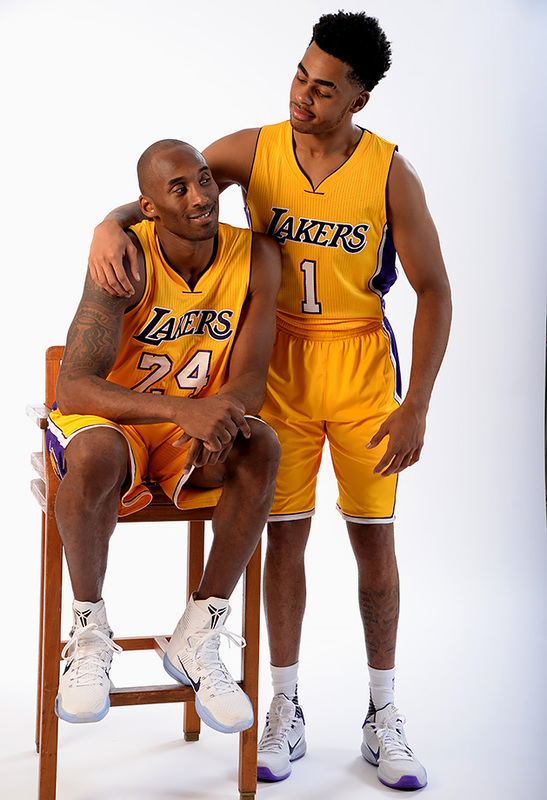 Lakers rookie D'Angelo Russell puts his arm around Kobe, who debuted with the team the same year Russell was born (1996), during this photo shoot in 2015.